Tejas Moses, a fine arts and sustainability dual major. Photo by Julianna Sagliano. 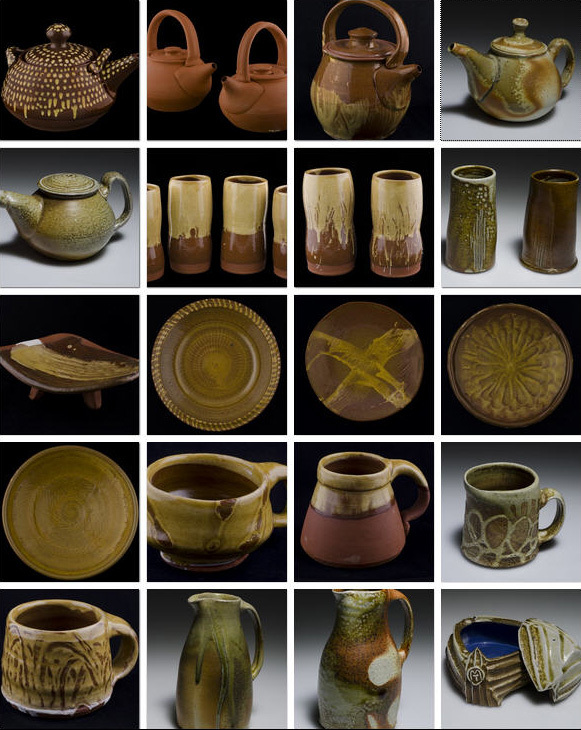 CLICK TO VIEW SLIDESHOW: Pottery by Tejas Moses. Some objects improve our lives simply because they are beautiful. So says Tejas Moses, a junior fine arts and sustainability dual major who works in ceramics — crafting pots, plates and pitchers out of merest clay. Moses’ interest in usable pottery stems from his fascination with Japanese folk art pottery, the Mingei tradition from the early 20th century emphasizing simple forms hand-made by local craftspeople from local materials. The pottery was produced in large quantities and quickly, intended for mass use. “I appreciate these pots for the rough qualities of the natural materials they are made from, their humble, refined forms, and the spontaneity and gestural energy of the marks their makers made on them,” says Moses. Moses wanted to try his own hand at the art, following the same process, from dirt to pot, that traditional Japanese artisans employed. 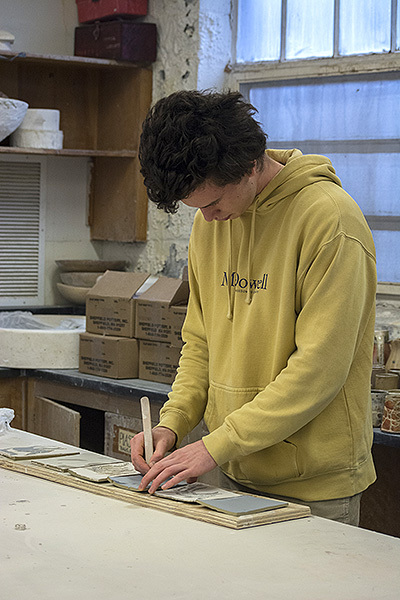 So he applied for a UNH Research Experience and Apprenticeship Program award under the mentorship of Don Williams, a UNH lecturer and ceramicist. The award funded a summer research and creativity project. He read books on the Mingei tradition, talked to artists, and visited art galleries and museums. Then he made pottery. As a student of sustainability and in keeping with the Mingei tradition, Moses challenged himself to using human-powered tools whenever possible for his project and to sourcing his clay locally – right from the earth. Finding suitable clay was not easy. After searching riverbanks and testing sediment to no avail, he scoured geological maps and decided that coastal areas would be a better bet. He eventually found a usable clay at a construction site on Durham Point Road that he stumbled upon, where the workers were only too glad to have Moses cart away unwanted soil. The deposit had the right ratio of clay particles to sand to fluxes such as iron oxide, Moses said, something he could only determine by making a vessel and firing it to see what happened. It worked. He had found clay for a low-fire earthenware. Now Moses had to turn hundreds of pounds of raw clay into a plastic body that could withstand the pottery-making process. Sticking to his sustainability plan, he used hand tools and his own energy, adapting techniques from a 1960s documentary about traditional Japanese potters. “I crushed the clay into small pieces with a sledge hammer before immersing it in water in a trash barrel and mixing it daily with an oar from an old canoe,” says Moses, explaining how the process eventually produced a suspension of clay particles that he removed, strained through a window screen and dried on a canvas drop cloth. Then, when the clay was at the right plasticity, Moses mixed it by stomping on it with his feet. Following this painstaking process, Moses produced 300 pounds of clay. By the end of the summer, he had used 250 pounds of it to create about 80 pieces of pottery, thrown on his foot-powered potting wheel called a kick wheel. He used the same clay as a base for a hand-made glaze, which produced a “pleasing honey color,” he says, that fit well with the clay body and forms he created. When it came time to fire the pots, he wasn’t able to find a wood kiln locally that would fire at a low temperature, so he resigned himself to using an electric kiln. Moses learned a lot from his project, he says, including getting valuable career advice from several notable New England ceramicists. And he learned about his relationship to creativity. Moses sold some of the 80 pieces he created and gave others to family and friends. He hopes that wherever his pottery ends up, it will be used to serve food and drink. He keeps a teapot and a set of mugs in his dorm room for just that purpose — to enjoy a drink with friends. Learn more about studying in UNH's department of art and art history.